And also to be reminded that, whatever those crooks who govern us say, the process to set up their secret companies in Panama and trusts in New Zealand began IN MARCH 2013. In other words, they are not tied to corruption linked to a single project but are ‘container vehicles’ which the three of them set up immediately they got into government, to maximise the general and specific opportunities for corruption and off-the-radar deals. 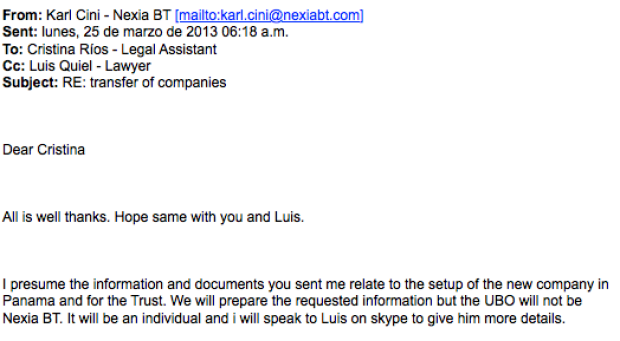 These are the emails in which instructions are given for the setting up of the third Panama company and trust, Egrant Inc. I reproduce them because sometimes, we need to have our memories refreshed with the facts in a sea of propaganda and lies. Karl Cini of Nexia BT tells Mossack Fonseca in Panama that the UBO – ultimate beneficial owner – is to be an individual, and that the details will be given over Skype. Details for Konrad Mizzi and Keith Schembri were given in emails, which is how the world found out about them. All the information in the Panama Papers is the contents of Mossack Fonseca’s email server and any documents that are not emails are documents that were sent/received by email. The owner of Egrant is either more important or more cunning, or both, than the owners of Tillgate (Schembri) and Hearnville (Mizzi), or Karl Cini simply felt that he had to protect him more thoroughly because of his heightened status. It’s so obviously Joseph Muscat, considering that it was set up in tandem with Mizzi’s and Schembri’s, that it’s not even worth speculating any more. We can start off from that premise and assess all his actions and decisions from that basis, including the fact that he carries on protecting and operating with Schembri and Mizzi instead of kicking them downstairs and out through the door.